For all the progress we’ve made in mobile technology, from foldable displays to 5x zoom periscope lenses, we are still at the mercy of flat and solid rectangles that are our batteries. The only solution we have to prolong their use is to put more inside crammed spaces. And while power banks can stave of the red indicator for a while, you’ll eventually be forced to run for a power socket. When you do, you might want to have Xiaomi’s charging tech on your side to charge to full in just 17 minutes. The Chinese company dropped a teaser with very little warning that showed off this also unexpected new technology. 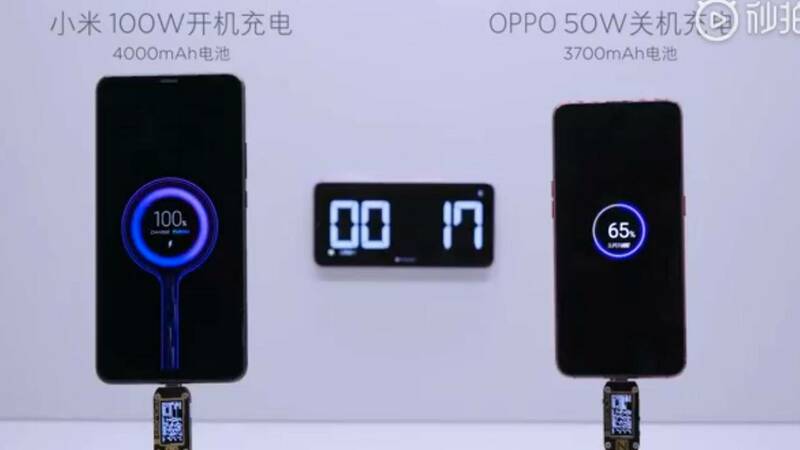 It pitted an OPPO RX17 Pro with a 3,700 mAh “dual” battery against an unnamed Xiaomi phone with a 4,000 mAh battery. To keep the story short, Xiaomi’s phone went from 0 to 100% in 17 minutes, while the OPPO RX17 Pro ended up with 65% only in that same amount of time. The OPPO phone used a new Super VOOC technology that could output at 50W max. Naturally, Xiaomi’s 100W would run circles around that even if it had to fill a larger 4,000 mAh pack. Still, there are more factors to consider than just speed. In fact, speed might be the least important. The only way to get fast charging speeds is really to output more power. When you do that, however, you also produce more heat which, as the Galaxy Note 7 proved, is a bad thing. Each quick charging technology has its own gimmick on how to dissipate heat. In the case of the OPPO RX17 Pro, that comes from a combination of OPPO’s proprietary charging IC as well as splitting the phone’s battery into two 1,750 mAh units. Xiaomi, however, is less forthcoming with the exact details which would determine whether this 100W charging is a wonder or disaster waiting to happen. If it does manage to pull it off without incident, it will be able to easily leapfrog over the competition in a flash.